Bingo! We have a winner! This giant love bug is looking for his family, and he's ready to impress with good leash manners, a calm demeanor, and a gentle affection for everyone he meets. 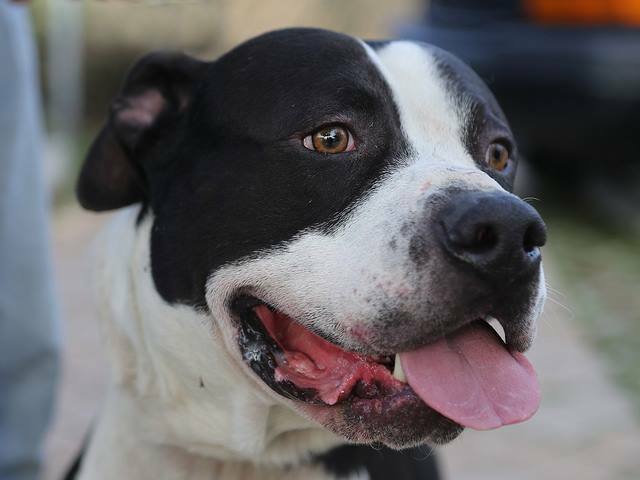 Bingo is an easygoing dog who loves to lean his head against you. A playgroup superstar, he expertly adjusts his play style depending on who he's matched up with. Whether he's playing with males or females, pups or elder dogs, Bingo is confident, reliable, and fun! After seven months in the shelter, Bingo has moved into a foster home and is taking to it like a fish to water: he's relaxed, quiet, and content to lie around watching his human, gently wagging his tail. Bingo is crate trained, fully grown at about 5 years and 85 pounds, and is sweet as can be. Cheerful and good-natured to the core, Bingo is a joy to be around. He connects well with his handler and is an eager learner who responds very well to positive-reinforcement training. He's already got a few nice behaviors on cue, so ask to meet Bingo so he can show them off for you. Weekly training classes with BADRAP.org are included for FREE with Bingo's adoption. Come meet him today! Bingo is in foster and not housed at the shelter. Call or message Berkeley Animal Care Services to arrange a meet and greet. ADOPT BINGO and HIS ADOPTION FEE IS WAIVED! BINGO's Adoption Fee ($125) has been paid for by a generous member of his fan club, so if you adopt BINGO, the fee will be waived! Bingo has been good with other dogs.